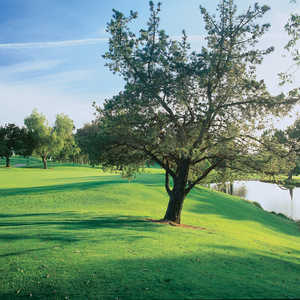 POWAY, Calif. -- Maderas Golf Club could survive on its vistas alone. Elevated tees, especially down the stretch, give golfers panoramic views of the hillsides and valleys below. 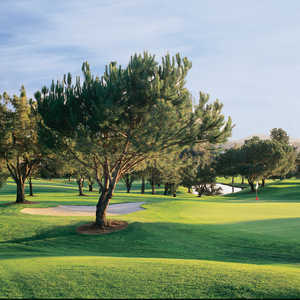 Add outstanding conditions, including smooth putting surfaces, and it's no wonder that the golf course has consistently been ranked at or near the top of many lists of the top public golf courses in the San Diego area. The par-4 13th at Maderas Golf Club in Poway, Calif. But what really sets Maderas Golf Club apart is the service. From the time you drop off your golf bag, the staff's enthusiasm is evident. It continues in the shop and the restaurant and all the way to the first tee, where ex-military personnel serve out their retirements helping folks get around this majestic golf course. "One of the things we're proud of is not only do we have a great golf course with a super layout," Maderas General Manager Bill O'Brien said. "But we also have a very friendly staff. And that's what creates a great experience." Of course, it does start with the product, and the golf course is truly one of the more memorable layouts in southern California. Opened in 1997, this par-72 golf course -- which plays as long as 7,167 yards from the back tees -- was designed by Robert Muir Graves and Johnny Miller. They took advantage of the dramatic natural topography, routing holes in and around rocking cliffs, creeks and verdant forests. The course has many dramatic features, including five waterfalls, three lakes and more than 40 acres of wildflowers. It's almost as much fun to look at as it is to play. But make no mistake. Maderas Golf Club has one interesting hole after another. The course gets dramatically more difficult as you get into the round. The closing holes on the front nine, for example, require carefully placed tee shots and precise approaches. Finding the right part of the green can also be crucial to avoid three-putts on difficult greens. Picking a so-called signature hole would be difficult, but it doesn't get much more dramatic than the finishing stretch. The 15th, for example, is a downhill par 3 that can play more than 250 yards. And from the elevated 18th tee, you can see all the way to the clubhouse -- some 600 yards away. Aside from the course, Maderas Golf Club has outstanding practice facilities, including a large grass range, short-game area, practice bunkers and putting greens. In addition, lessons are available from award-winning director of golf instruction John Darling and his staff. Maderas' Tuscany-style clubhouse also has a restaurant as well as meeting space. The Del Lago Ballroom and its gardens are available for parties and special events, accommodating as many as 300 people. And the Grille at Maderas G.C. not only attracts golfers, but also outside business with its eclectic menu of local flavor found in such favorites as fish tacos and ahi tuna burgers.